Australia seized control of Pool B as they put Wales to the sword with a physical and dynamic show in Cardiff. Their greater power told in a ruthless first half, Stirling Mortlock, Matt Giteau and Chris Latham scoring tries. Gareth Thomas and Sonny Parker had been taken off following heavy tackles, but Wales fought back from their 25-3 half time deficit with a Jon Thomas try. 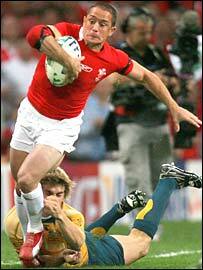 Hopes of a recovery were ended by Latham's second try from a garryowen, Shane Williams scoring a consolation. The result means that the Wallabies are likely to face a quarter-final in Marseille against either Samoa or England. If Wales can secure second spot in the group, they will expect to meet likely Pool A winners South Africa, also in Marseille. Wales had an awful start, failing to control ruck ball from the kick off and conceding a first-minute penalty, kicked by Mortlock. But the visitors were also nervous, and a mistake from Drew Mitchell on the slippy Millennium Stadium turf set up the position for Stephen Jones to equalise following a penalty at the scrum. 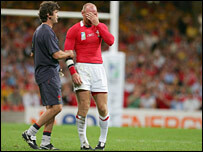 Jones missed a second chance, and a woeful kicking game again cost Wales when Gareth Thomas' poor clearance put the Wallabies on the offensive on the home 22. Berrick Barnes - the rookie fly-half brought in for his first Test start at the last minute in place of knee injury victim Stephen Larkham - threw a delightful inside dummy and found Giteau supporting inside him, the number 12 crossing under the posts. What do you think of my player ratings? Australia's greater physicality made its mark, Parker taken off after a heavy tackle. Thomas, who had earlier put in a late tackle on Barnes, moved to centre in place of Parker, and was immediately hammered by a shuddering Mortlock challenge. The Wales skipper was helped from the field, the changes bringing Kevin Morgan on at full-back and James Hook at inside centre. Jones missed a penalty, before the Wallabies ruthlessly seized on another Wales mistake. A strong Lote Tuqiri tackle on Mark Jones knocked the ball loose from the Wales winger, prop Matt Dunning quickly gathering possession and feeding George Gregan. The veteran scrum-half chipped over the defence, Mortlock powering onto the bouncing ball, gathering, and crashing over in the corner. Gareth Jenkins' disheartened side were desperate for the interval, but Wycliff Palu allowed them no respite, powering off the base of the scrum with the last move of the half. The ball came to Giteau, whose pin-point pass gave Mitchell a run to the corner. The winger ran out of space, but fed inside to man-of-the-match Latham, who crossed for the third try. Mortlock went off at half-time, and the home side gained extra hope as they mounted a sustained attack straight after the break. Hook and Colin Charvis went close as Wales battered at the Wallabies' line, before Jonathan Thomas worked his way over from close range for a try, converted by Hook. Giteau missed another kick, Wales then eating into the Wallabies' lead with a Hook penalty. But the Ospreys star fell short with another from 47m, and hopes of a fightback were extinguished by Latham. The full-back put in a monstrous up-and-under that Stephen Jones made a hash of catching, Latham following up quickly to regather the loose ball and enjoy a clear run to the line. With the clock ticking down and Mitchell in the sin bin for a dangerous tackle on Matthew Rees, Wales at last began to put together their favoured brand of attacking rugby. Charvis was held up over the line as Nathan Sharpe was yellow-carded for killing attacking ball. From the resultant scrum Wales stretched the 13-man Wallabies, Shane Williams able to scramble over in the corner to maintain Welsh spirits. The victory was Australia's third over Wales at World Cups in Cardiff, having triumphed in 1999 and 1991, while Wales beat the Wallabies in Rotorua in 1987. Wales: G. Thomas, M. Jones, Shanklin, Parker, S. Williams, S. Jones, Peel, Jenkins, Rees, A. Jones, Gough, A. Jones, Charvis, M. Williams, J. Thomas. Replacements: Hook for G. Thomas (22), Morgan for Parker (18), Phillips for Peel (70), R. Thomas for Rees (66), D. Jones for A. Jones (66), Owen for Gough (66). Blood replacement: Popham. Australia: Latham, Mitchell, Mortlock, Giteau, Tuqiri, Barnes, Gregan, Dunning, Moore, Shepherdson, Sharpe, Vickerman, Elsom, Smith, Palu. Replacements: Staniforth for Mortlock (41), Huxley for Barnes (78), Freier for Moore (68), Baxter for Shepherdson (73), Chisholm for Elsom (76), Waugh for Smith (64), Hoiles for Palu (66). Sin Bin: Mitchell (66), Sharpe (75).